Very high sunscreen sensitive skin, hypersensitive to the sun or exposed to intense sunlight. 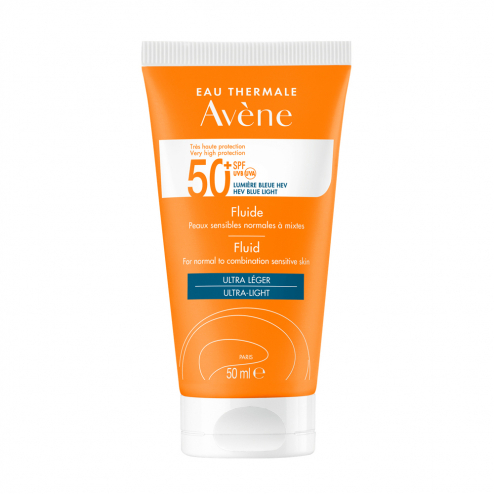 The 50+ fluid provides optimum protection against UVB UVA radiation. Enriched with Avene thermal water and mattifying powders, its light texture gives your skin a matte and not shiny finish. UVB-UVA filter system, very wide photostable spectrum. Unique antioxidant complex, overall cell protection. Avene thermal water soothing and anti-irritation. Before sun exposure, apply an average of 6 doses to the face and neck. Repeat the application frequently to maintain protection, especially after sweating, sweating or wiping. Do not stay too long in the sun, even if you use a solar product. Avoid exposure between 11h and 16h. Avoid contact with the eyes and in case of contact with the eyes, rinse thoroughly with clear water. INCI Formula: Avene Aqua, C 12-15 Alkyl Benzoate, Methylene Bis-Benzotriazoyl Tetramethylbutylphenol [Nano], Water (Aqua), Cetearyl Isononanoate, Diisopropyl Adipate, Isodecyl Neopentanoate, Bis-Ethylhexyloxphenol Methoxyphenyl Triazine, Diethylhexyl Butamido Triazone, Aluminum Starch Octenyl Scucinate , Butyl Methoxydibenzoylmethane, Potassium Cetyl Phosphate, Decyl Glucoside, Acrylates / C10-30 Alkyl Acrylate, Crosspolymer, Benzoic Acid, Caprylic / Capric Triglyceride, Caprylyl Glycol, Disodium Edta, Fragrance (Fragrance), Glyceryl Behenate, Glyceryl Dibehenate, Glyceryl Laurate, Hydrogenated Palm Glycerides, Hydrogenated Palm Kernel Glycerides, Propylene Glycol, Silica, Sodium Hydroxide, Tocoheryl Glucoside, Tribenein, Xanthan Gum.